At the time of writing, upgrades are supported for the Weebly, SpamExperts and SiteLock MarketConnect services. Note that services may only be upgraded (downgrades are not supported). Upgrades require paying a full term on the new plan level. Upgrades must also be made to an equal or higher billing cycle. For example a user could upgrade from Quarterly to Annual billing, but may not switch from Quarterly to Monthly billing as part of an upgrade. When an upgrade is purchased, you will receive an automatic credit for any unused remaining time of the current plan. Upgrade billing to end users via the WHMCS software works in the same way. 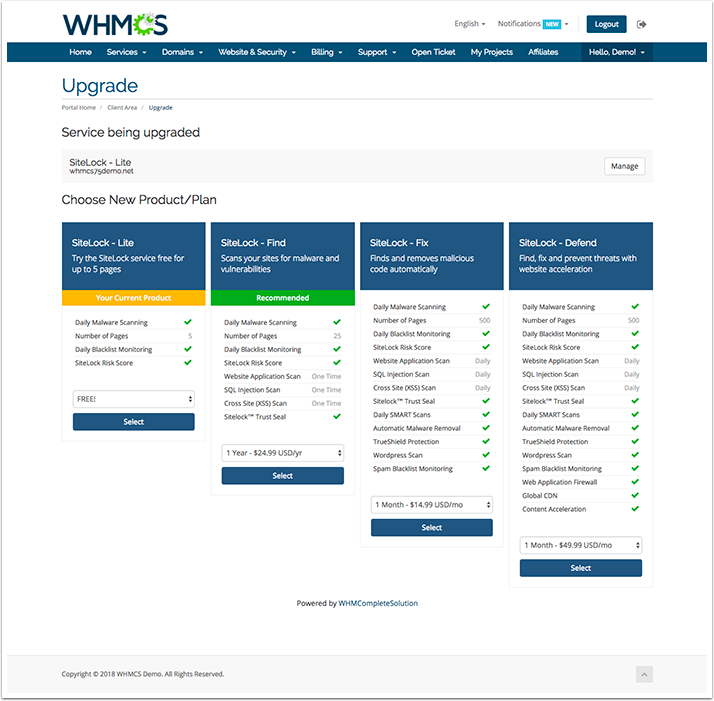 Upgrades must be ordered via the WHMCS client area. An upgrade button is displayed in the client area when viewing any MarketConnect service, or a hosting service with a MarketConnect add-on attached to it. 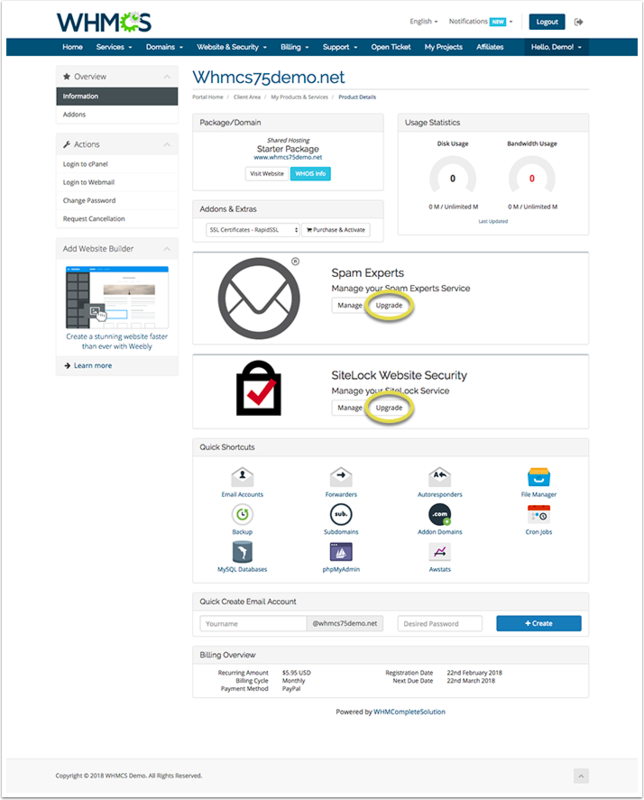 An example cPanel hosting account service with both the SpamExperts and SiteLock services active is pictured below with the upgrade buttons highlighted. Clicking the Upgrade button will show the end user a list of all available plans, including the recommended upgrade product. After selecting the desired plan to upgrade to along with desired billing cycle, the upgrade will be added to the users shopping cart as indicated below. In the example shown it is an upgrade from a free plan to a paid plan. In the case of a paid plan upgrade, the credit amount of the unused time will be itemised in the cart view and automatically deducted from the total due. Upon checkout and payment of the amount due, the upgrade will be automatically provisioned.